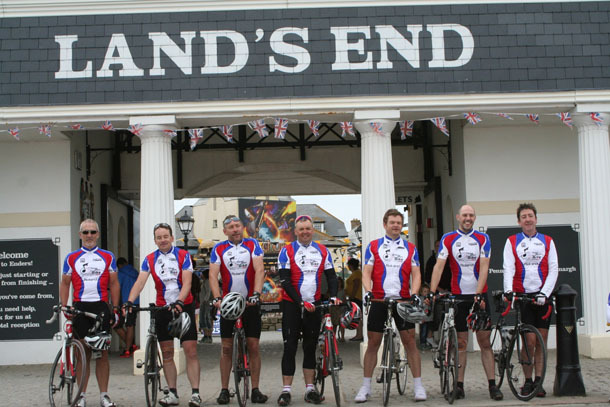 The Three Men on a Bike Team finally made it to Lands End, after a gruelling 10 day, 926 mile epic cycle ride raising over £40,000 for Children in Need and Music for All. Open eyes, open curtains, you know the drill – except…today is different. The sky is blue, there is a car park outside and there’s a pub too. But we’re in Bodmin and about to complete an absolutely epic 921 mile journey (hopefully) arriving in Lands End at around 4pm. The scale of the challenge has been both physical and mental. The latter, far more than I expected. Getting out of bed and cycling 90 miles a day for 10 days is beyond normal and ‘dealing’ with that has been hard. And we have to do it, just once more. Yesterday was brutal for climb, today is not much better, let’s just hope the adrenaline pulls us through. Neil’s birthday today, so we sing Happy Birthday on the start line – that was different! 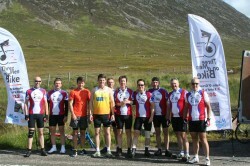 Then we’re off, only 63 miles today but loads of Lewis-friendly climbing in store. As it was his birthday, even Neil was enjoying the hills. A stop at 25 for second (or third?) breakfast and the pace continues. Two groups today (almost a team?) with Peter scouting well ahead. Lunch stop at Penzance and suddenly we’re within 10 miles of the finish. Lewis has one more trick up his sleeve for a picturesque if slightly over-hilly detour (thank goodness for the phone) and before you can blink, Lands End is in sight. A pretty significant crowd awaits us at the finish line, mostly tourists curious to see what nutters are coming in next. Big cheers, applause and we’re through. I think there was more relief than elation, this has been the hardest thing that any of us have done, or will probably ever do again. It felt like it would never end, but it has now. Someone described it as the ultimate stag do without alcohol, there was very little of the latter – might catch up on that tonight – but seven guys with support from Rose and Terry and friends from across the industry did somehow pull it out of the bag. The words ‘Thank you’ seem so inadequate when we have had such incredible support from so many people. The team at Roland, Janine, Helen and Martyn and many others, have worked incredibly hard at fund raising and all of the administration behind the ride. We could not have achieved this without you. Terry and Rose, you are the best surrogate Mum and Dad and we would all adopt you. Terry looking after the bikes and driving, and Rose rebuilding bodies and filling them with calories! Great fun too. And then the team. 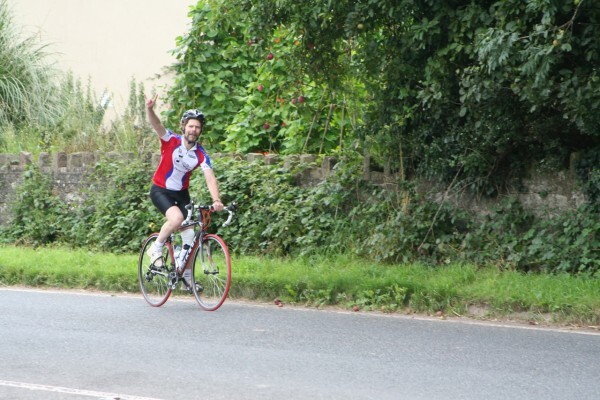 Everyone pulled together when it was needed, but special thanks to our resident pro-cyclist SImon Lewis who has been a great coach to us all and kept us safe. No one died!! A few got injured…. Lastly I must thank everyone who has donated money. Your generosity will help to change people’s lives, we were just the catalyst to make that happen. Thank you, thank you. So what next for Three Men on a Bike? 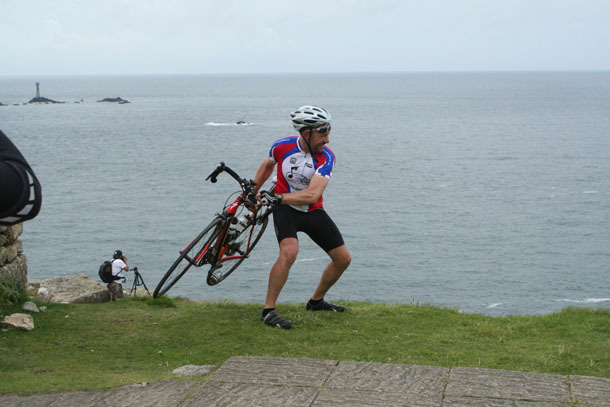 Well, as I write Simon is depositing his bike over the cliff at Lands End . 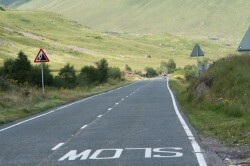 For me, JOGLE 2012 is the right time to retire from such events. It doesn’t get much bigger than this and what better than to go out on a high. I can’t speak for Peter as he’s so far ahead of our peloton he can’t hear what I’m saying. I am sure though, we will all continue to ride for pleasure (but only on a sunny day). I’d like to say that there was some pleasure in this last ride, but the bruises and aches sustained during day nine are still too raw. Maybe next week we’ll reflect on that. It has been an enormous privilege to be part of this team, but most of all, so humbling to be able to be a part of raising so much money for two fantastic charities. As I write the total is over £40K with more money still to come, we could end nearer to £50K. Tomorrow it’s back to normality (what’s that?) 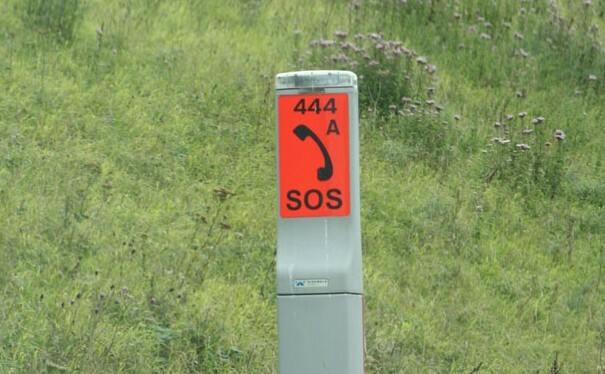 – we leave early for the annual car park that is the Bank Holiday M5. 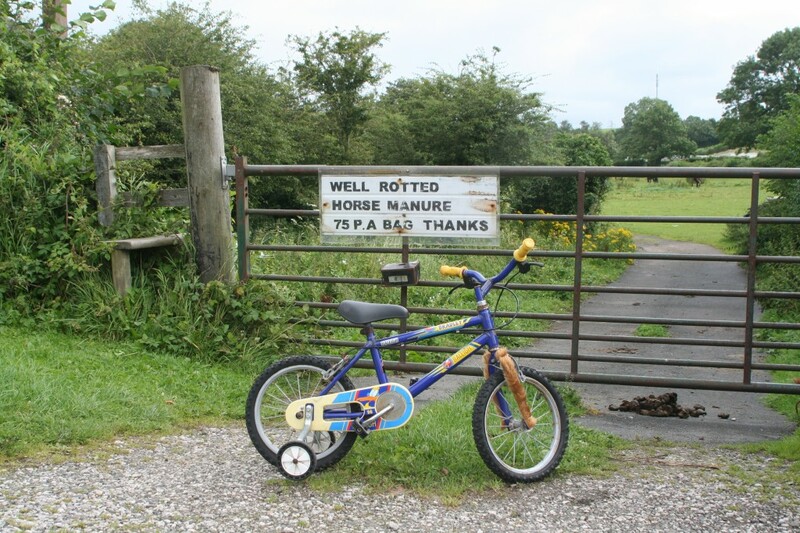 It’ll probably be quicker by bike…. Open eyes, open curtains, blue sky, lots of cars, I spy a beefeater pub, must be a Premier Inn then, give up guessing and go for iPhone GPS. Still in Taunton and about to embark on day nine. The normal routine kicked in with the planned departure at 8.30. The rules say 8 for 8.30. This basically means getting all your stuff out to the van by 8am, leaving half an hour to get the bikes ready, polish your helmet and prep for the day. Checking tyre pressures is also a critical part of this prep and, as you can see here, it normally takes around three people to help Peter sort his. It still hasn’t sunk in, just what we’ve achieved so far. 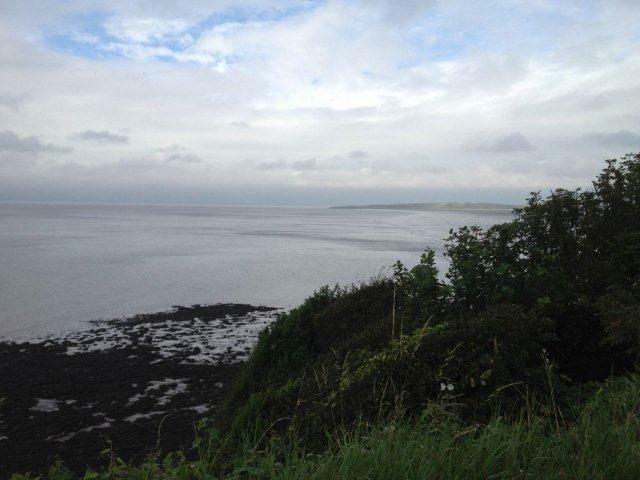 The last major emotional moment was crossing Scotland and getting to the English border sign. Somehow now, we’re in Somerset, 750 miles into this epic and we’ve cycled every mile. The physical and emotional strain is now showing on all of us. Injuries and frayed nerves have taken us all to places we didn’t expect to be. And that strain was showing this morning. No guest riders today, so the core team only, and within minutes of the ride starting we’d split into separate teams. Sat navs were on the blink so various different routes were also taken today. 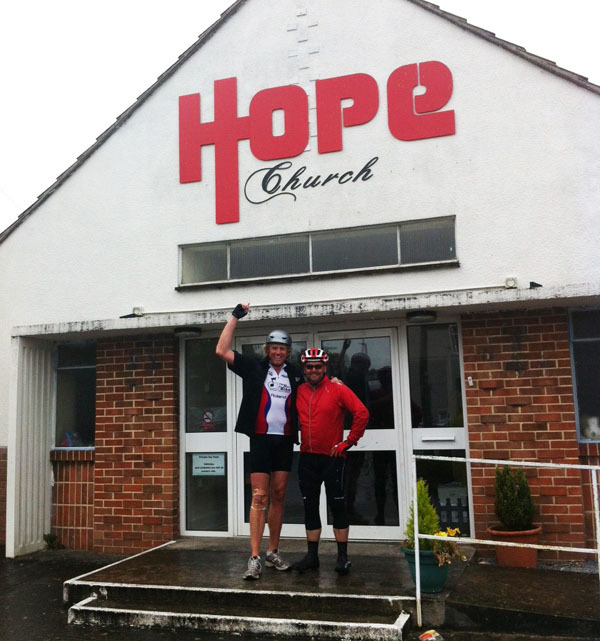 The only common goal was getting to Bodmin, alive! First stop today was Silverton, the village where Jules lives. Quite a reception committee awaited us as we arrived, with several of Jule’s family and friends taking the day off work to greet us. Here on in, the group split further, the main challenge being to complete a gruelling day of climbing, with every force of nature trying to get in our way. This wasn’t ordinary rain, or even M and S rain: this was the kind or rain where each drop is the equivalent of a bucket of water. It was brutal and the course the toughest that anyone of us have ever done. Here’s the map and elevation graphic for the day. I have never seen so many climbs. Steep and long and repeating over and over. 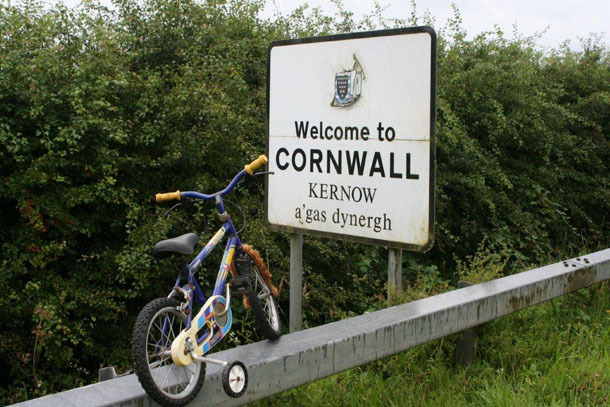 I cycled up rivers, down rivers and through them and still Bodmin always seemed to be 10 miles away. The last of the group came in well after 7pm. Few words were spoken, I think Peter’s face said it all. Bradley however seemed to have had a great day. He’s been busy the entire trip checking out all kinds of sights and joins us wherever we start and stop. Here he is just cruising into Cornwall. His full photo album will be published on the three men site after the ride. Neil – randomly knocking on doors to find a water re-fill – should have just held his hand out! Open eyes, open curtains….car park, Beefeater Pub across road, no clues. Get iPhone, GPS tracker, ah, we’re in Gloucester. Bark loudly for a few minutes and get released from my kennel, er sorry, room. We have a spectacular route today and are joined by the Boyz (Terry and Simon), the tandem (complete with Roland sound system) and Paul McManus, Chief Executive for the MIA and Music for All. Honoured company indeed. The Boyz started training last week and Paul had a quick zip round the car park last night. Today, we have 96 miles to do and not exactly flat – this is going to be tough. In addition, Myke from Bonners stayed on for another day and we’re joined by Peter’s brother-in-law, Peter James. As usual we set off at 8:30, the music blaring lifted our spirits – great choice of music too. 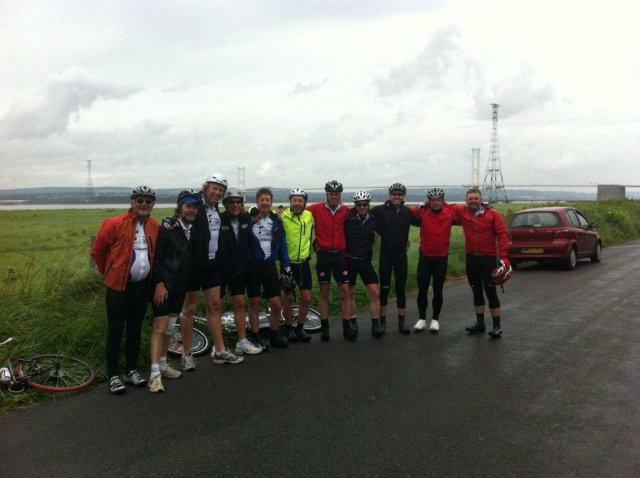 The first 30 miles took us to Chepstow: undulating would be an understatement. 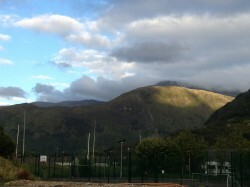 Very pretty, but some tough climbs, especially for the Tandem. 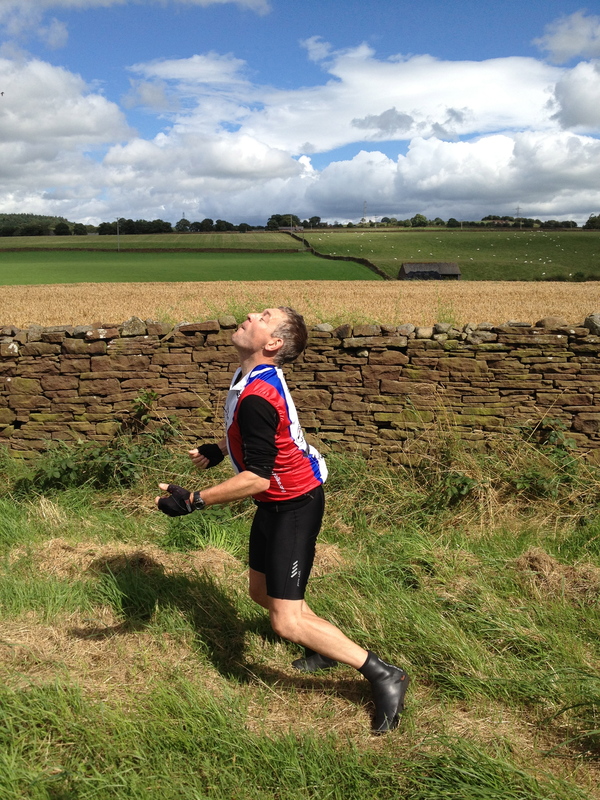 Paul impressed everyone immediately, as he flew his slender 10 stone up the hills. No problems there then. Anyone who’d put money on him not completing today was about to lose it. The road from Gloucester to Chepstow runs alongside the River Severn – beautiful. Just as we got to Broadoak the sun come out, there was blue sky, and I’m not making this up, we had Mr Blue Sky by ELO blaring on the tandem. It was surreal and hugely motivational, all at the same time. Costa Coffee at Chepstow was a welcome treat for all core riders, but we didn’t have too long to hang around as dark clouds were threatening. 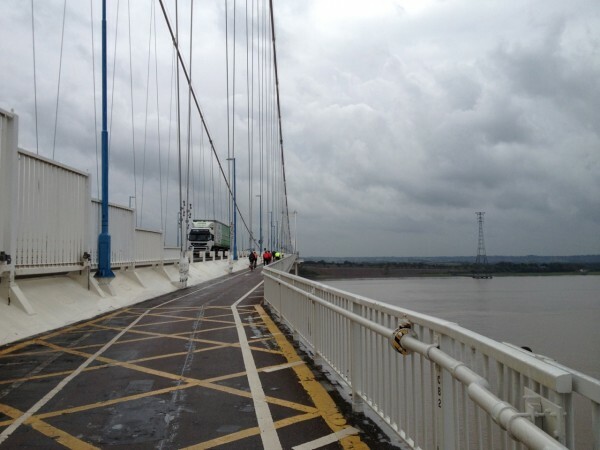 Next up was crossing the Old Severn Bridge on the cycle path running alongside the M48. Although a little breezy and the rain had started it was an incredible experience. ‘On a sunny day’ it would have been better. 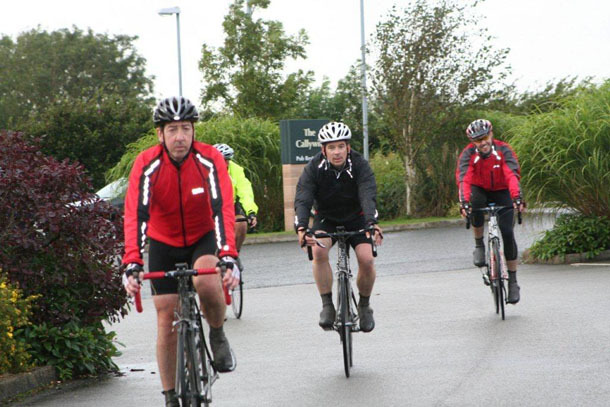 Here you can see our group cycling away into the distance. 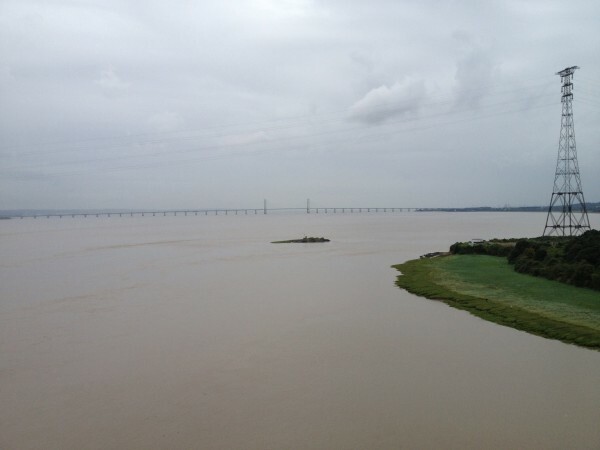 And this was our view of the second Severn Crossing. 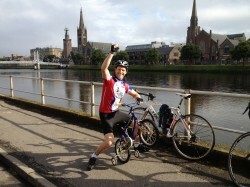 The bridge negotiated we celebrated with the ‘I just did that photo’. Through Avonmouth docks and then up over the Avonmouth bridge on another cycle path and we’re finally back into more rural territory. Lunch today was a stop at Roland DG, conveniently situated at the 50 mile mark. We were aiming to get there for 1.30pm and up until a few minutes before, we were right on track. 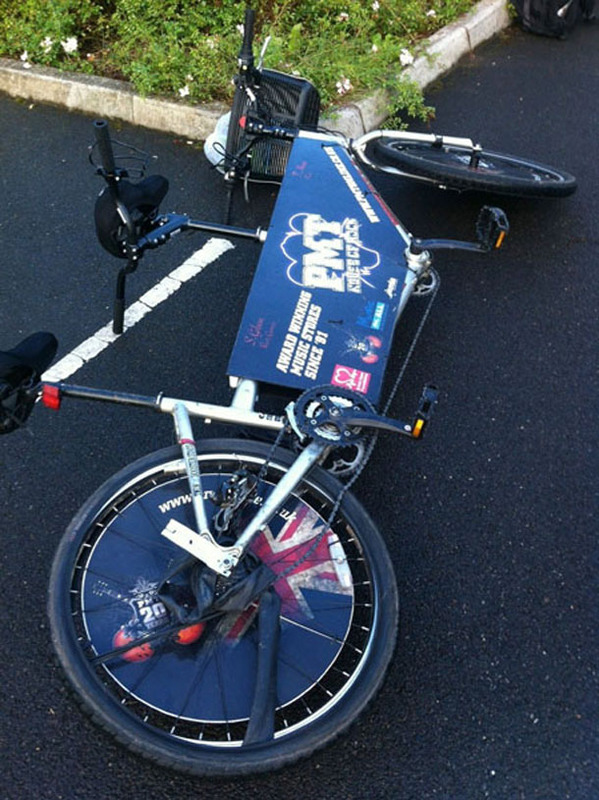 Less than a mile away, the tandem’s rear tyre finally gave up and we spent 20 minutes trying to fix it. Unfortunately Terry and Simon did not have a spare tube on them and we struggled to find a pump that would fit their valve, it was a different fitting to a road bike. Jules sprang into action and masterminded a very temporary fix but it did require all seven of us to have a go at pumping the tyre up. Limping along we arrived at DG, our welcoming committee had by now gone back to work, having waited outside for ages. The DG guys had done a special banner for us and laid on a superb buffet lunch. Thank you Jerry and your team, you have no idea just how much of a tonic this was for us. 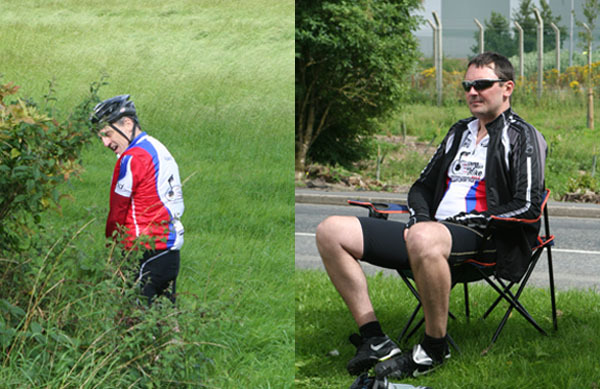 While we all tucked into lunch, Terry fixed the tandem and it wasn’t long before we were due to leave. Here we all are with Jerry and friends. 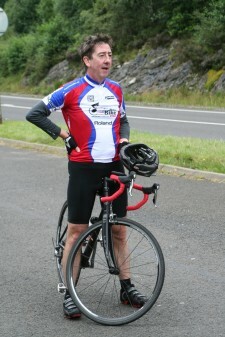 A short debate ensued as Jerry Davies insisted on joining us for the ride. As the rain started to get heavier, he suddenly had to take an urgent call in the office. 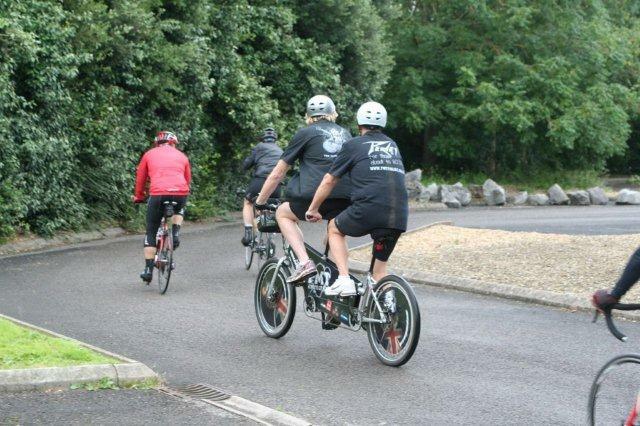 Simon and Terry seized their chance, leapt on the tandem and we were off again. Just outside Weston-Super-Mare a pretty tough hill awaited us. 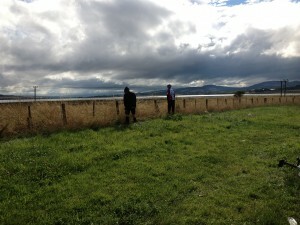 Just before we attempted it we stopped off for a short prayer, to give us strength. Weston next with the wind and rain getting up. 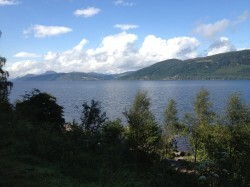 Here is the stunning view from the back road into Weston. 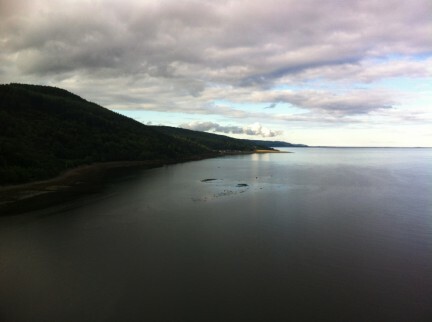 You see a view like this for at least two miles. Weston was deserted, not surprising considering the wind and rain, and we were able to easily cycle along the front. After a brief stop, we faced the small matter of the last 25 to do and the rain wasn’t giving up. The last 25 normally feels more like 50 but today, it felt like 75. We were on the A38 all the way and the traffic and rain were not a great combination. 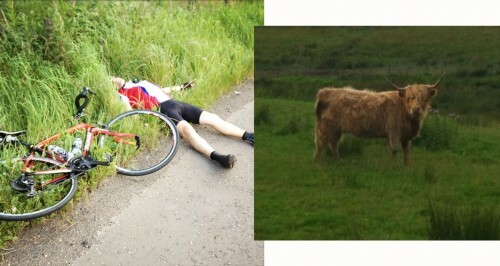 With two miles to go, the tandem developed another puncture, but no one, least of all the Boyz, wanted to stop. They cycled in to the finish line riding on the rear rims and seconds after crossing, the whole of the rear gears collapsed, good timing or what! Huge thanks to all of the additional riders today for their support. I hope that their weekends are not too painful! For us, we are approaching the finish line with just two days to go. 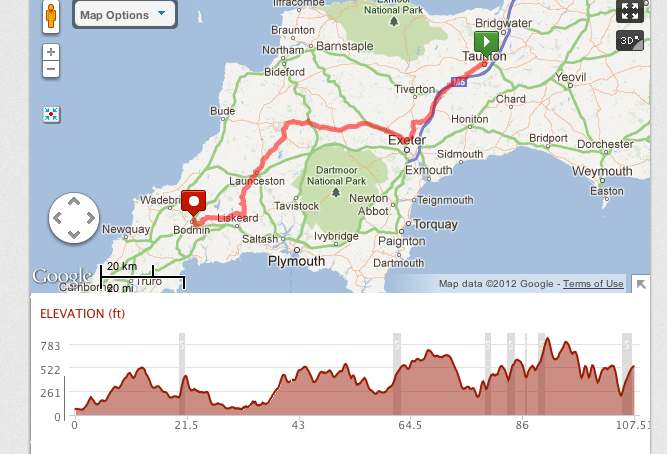 Unfortunately our greatest challenge awaits us tomorrow on the ride from Taunton to Bodmin. 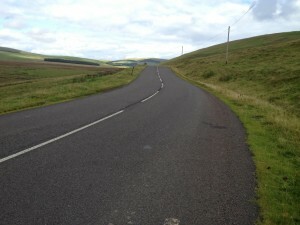 107 miles and by far the biggest climbing of the whole ride, yes, worse than Scotland. Devon is not famous for its flat roads, as we’re about to find out. Oh, and I almost forgot to mention, Fish-Griffiths says it’s chucking it down. If there was ever a day to donate to spur us on, Saturday is it – thank you for your support! Open eyes, open curtains, check location. Yes it’s Crewe Premier Inn. A relaxed evening yesterday at the nearby pub. It was quiz night so in addition to us shouting out all of the answers, Peter stole the mic and raised £55 for the charities from the various quiz teams. Another grey morning today, thankfully no rain. We seem to be very lucky recently, this luck will probably run out by the weekend. 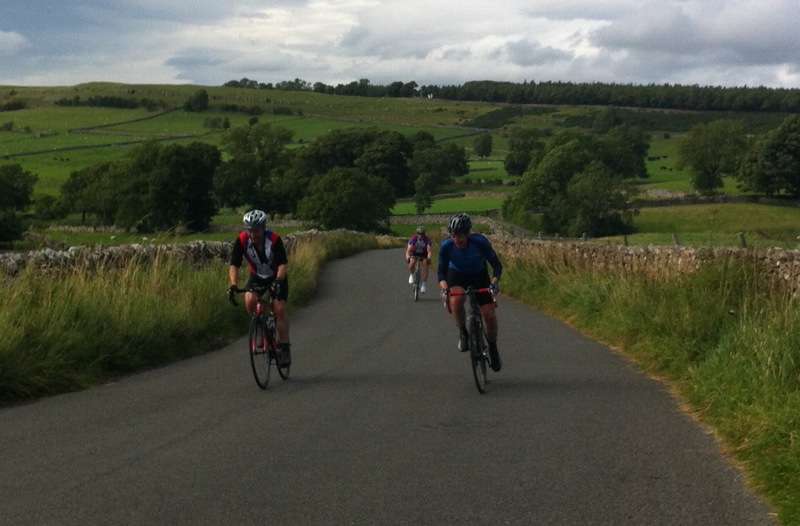 Guest riders today include Paul from DV, Neil Cowmeadow and Myke from Bonners. A big day ahead as none of them has cycled 100 miles yet! Here we all are, raring to go? The guest riders (fresh legs) definitely gave our younger core riders a run for their money this morning. Lewis sorted this out later, reminding everyone ‘who wears the white shoes’. Having trawled eBay last night for a replacement leg and failed to win any of the auctions (you’d be amazed at what goes on on eBay after midnight) I had to resort to drugs today to ‘manage’ my knee pain. We’re all gradually succumbing to the stresses and strains of this massive endurance marathon and there’s barely a man on the team without issues. Sorry, that should read, without health issues. Firmly keeping the family together (quite literally) is the multi-talented Rose. One moment she’s running Ruth’s Rolls, the finest lunch van on the JOGLE run, the next she’ll be rebuilding someone’s legs in her physio capacity and then without batting an eyelid, she’ll turn into expert bike mechanic. Girl power has nothing on this! So the ride: painful, ouch, long, kinda sums it up. First stop was outside a McDonalds for a rare coffee stop. 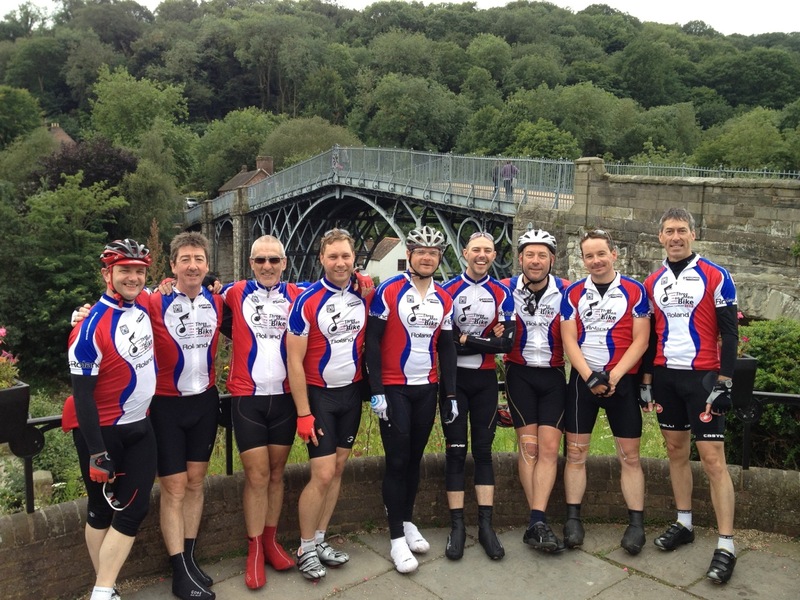 We then sped down the Ironbridge Gorge (just beautiful) into Ironbridge itself. Photo of the team here in front of the bridge. (I was behind the camera, just in case anyone thought I was having the day off). There are two ways out of the Gorge, both are up but one is really quite steep. The Three Men chose the long gradual haul out of town, the rest of the support riders abandoned us (!) to show off to each other on the really steep one and compare the size of each other’s bikes. Reunited at the top and ‘King of the Mountains’ awards completed (Lewis) we set off on a frustrating, undulating section of road which seemed to go on for ever, en route to Kidderminster. 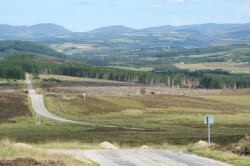 I’m even beginning to actually recognise some of the places we’re cycling through! Lunch, then Stourport, Worcester and Tewkesbury and we’re in sight of home. Well, I say home? Premier Inn has become home, but the one here in Gloucester is a bit more like a kennel. Our worst by far: I could hardly fit the bike in the room. After today’s ride we clock up 650 miles and over 27,000 ft of climb for the ride so far. Everest is 29,000, so we should probably nail that tomorrow, assuming that ‘Make up my Ride’ gets the numbers wrong again. We’ll be joined by the Boyz from PMT (and tandem) and Paul from the MIA – anything could happen…. Day 6 (feels like 26) and we’re in Kendal. Guest riders today are Sean and David from Roland. Our mapping software tells us it’s fairly flat today, so 102 miles should be a doddle. As the title above proves, it wasn’t flat and as I sit writing this on my seventh pint in the pub next to the….Premier Inn (oh yes!) I can safely say that I am absolutely shattered. Nothing to report about the Premier Inn in Kendal, as it’s the same as the one in Dumfries, Dumbarton etc but the staff were particularly helpful. Laundry was the highlight of Rose’s evening (BIG thank you) and ours was an Italian restaurant. Terry spent the evening parking the van: quite brilliantly too, it has to be said. The following morning, grey clouds greeted us as we looked out of our Premier Inn windows to remind ourselves where we were: only 102 miles to go to the next Premier Inn. Leaving Kendal was slightly more challenging than necessary, with Lewis doing a spot of shopping as the rest of the group headed south. We managed to meet up again a few miles later, but it was extremely inconvenient balancing Simon’s shopping bags on our handle bars. The Griffiths brothers amused themselves today with some spectacular ‘drafting’. Neil selected a combine harvester and sped behind it allowing the slipstream to carry him along. Simon selected a muck spreader and cruised along in its wake. I think that I slip-streamed a couple of snails on a day trip to Leyland: it certainly made my day. We stopped in Leyland for lunch with Ruth’s rolls doing frantic business. The normal high quality fare was topped off with extra cucumber and malt loaf. We also get jelly beans and chocolate. Lunch is the only positive thing about cycling I can currently report. I’m sure I’ll feel better about it next week. Guest riders Sean and David rode superbly well today. For two guys who had not had much time for training, to pull a 100 miler out of the bag was pretty impressive. Sean made various attempts to join the Bladderettes, but sadly didn’t make the cut. I also felt a little sorry for David, who after being abandoned by Jules on a long hill (since hooking up with Simon, he’s just not getting this team thing) took the wrong turn and had to be rescued, a broken man, on the side of the road. Jules, how could you? Riding as a team or in groups requires incredible concentration. Cycling demands not only massive physical exertion, but also huge mental stamina too. In the interests of health and safety there are a considerable number of spoken communications and also hand signals. I’ll have to leave the hand signals as some are unprintable, but here are some of the repeatable spoken words. Lorry Up – red or yellow? Arriving at Crewe was an enormous relief. 100 miles is one heck of a long way and it takes forever. 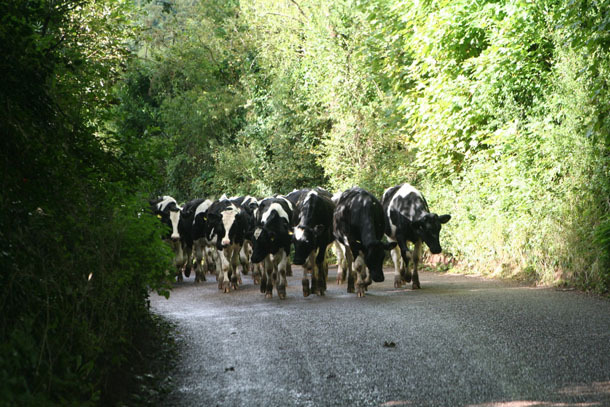 One or two of us had thought we might not make it, so to get everyone home was a real tonic. An early alarm call and incredible power shower, which blew head clean off my shoulders (quite the best thing in the Seaview Hotel) signalled the longest day of most of our cycling lives. 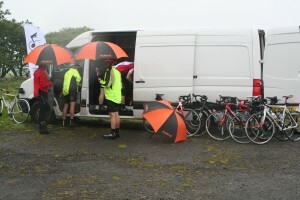 120 miles is a long long way – even longer in Scotland…much longer in the rain. 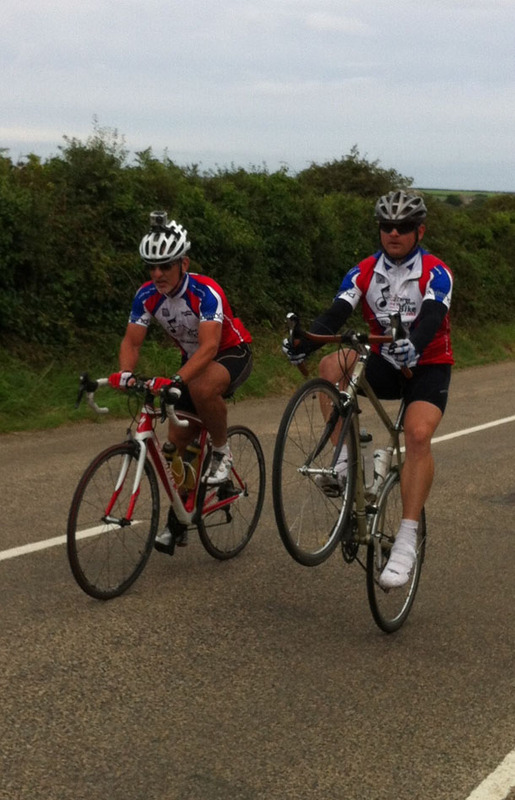 Three directors from Roland, have started training for a gruelling 926-mile charity bike ride this August. 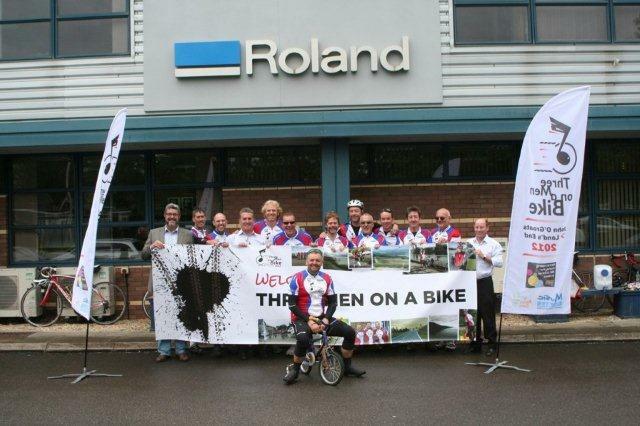 The executives from the Swansea-based company, which makes instruments used by artists such as Coldplay, Take That and Rihanna, will cycle from John O’ Groats to Land’s End in a bid to raise £40,000 for charity. 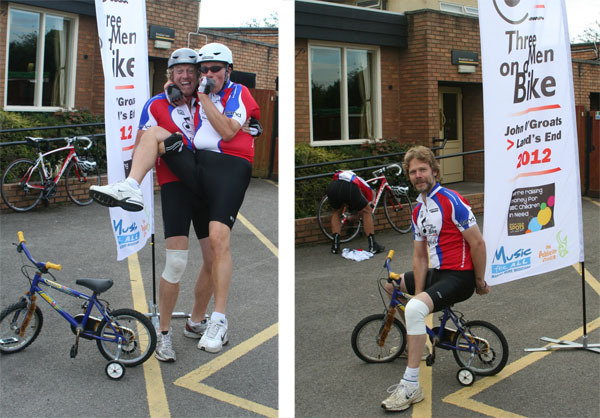 This is the Three Men on a Bike team’s second charity challenge. 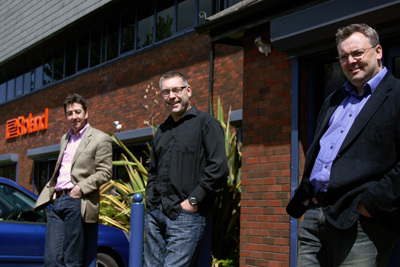 In 2010 Tim Walter (Managing Director), Simon Griffiths (Financial Director) and Peter Heath (Business Development Director) cycled from Land’s End to London, raising over £22,000. Since then, however, they’ve spent more time in the boardroom than on the road, so training has been intense. 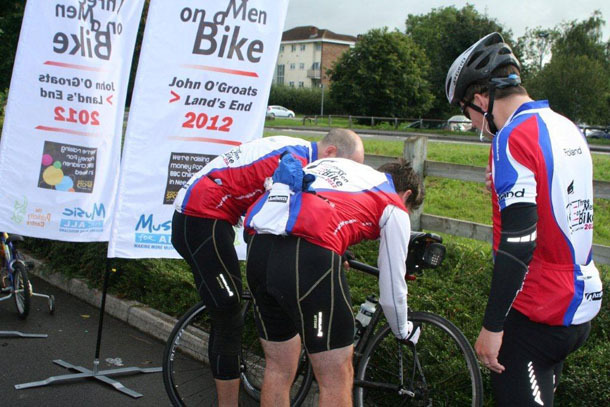 They have been training since January and will need to be in peak condition for the ride as they hope to complete the journey in 10 days – cycling an average of 92.6 miles a day. Of course it’s all for a good cause, and the team hopes to raise £40,000 for Children in Need and Music For All, a charity dedicated to making more musicians. If you want to show your support, please donate via Virgin money giving here. 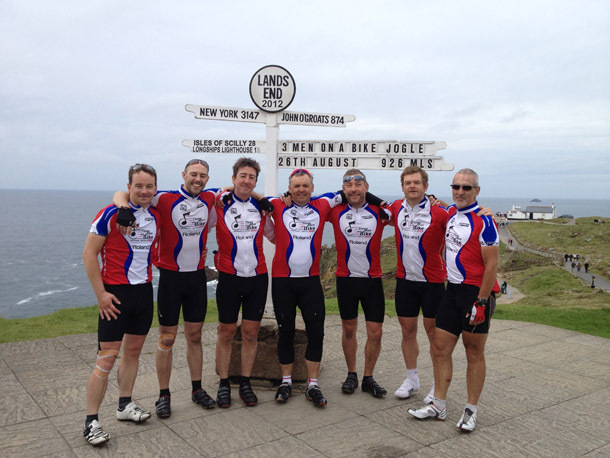 2010: 3 Men On A Bike (Lands End To London) – We did it! October 1st 2010 three unfit (but getting fitter) directors from Roland UK and a bunch of other music industry colleagues set off on a 430 mile bike ride from Lands End to London to raise money for Music for All & the British Heart Foundation. 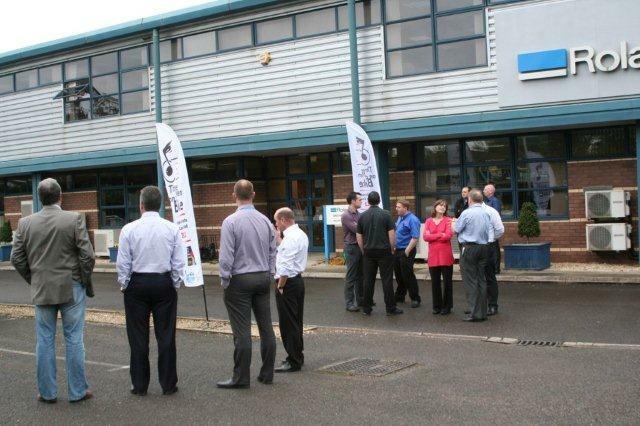 In total we raised over £22,000 for two worthy causes.